I've read other threads which hint at this problem, but I've not seen a good solution. If there is, please point me to it and I'll delete this post. I was honest and told them I voided the warranty by mounting it behind a different panel and despite offering to pay them in advance to take a look at it, Metasonix "politely" refused. So, that settled, I'm left to troubleshoot their module without a schematic, or source code. I bought a new R-60 to incorporate into my Steiner Synthasystem custom modular ressurection (http://user.xmission.com/~dingebre/Synthasystem.html). I dismounted it from the Metasonix panel in order to mount it behind a new matching panel. I'm using a Power One +/- 12 volt supply and I designed/built a small power conditioning PCB to generate the needed +5 with an LM317 regulator and some ferrite beads and capacitors for extra filtering/decoupling. It all powered up fine and I started the calibration process having read the manual. At the end of a successful calibration,I also did the extra step of hitting Low C and moving the pitch bend wheel and modulation wheel. The tracking is fine for about 4 or 4.5 octaves (consistent with expectations and published specs of the R-60). As the CV increases, an increasing magnitude ripple at about 200 to 400 Hz. At a 4 volt CV, the ripple is about 200 to 300 mV and distorts the sound terribly (see scope grab below). I've looked at the power supply and it is clean. The 5 volts runs a different Midi-CV converter without any problems. I've tried with the Steiner VCOs, JH LIving VCO, and three different MOTM Ultra 300 VCOs. I've tried with an Akai controller, Moog Voyager, John Bowen Solaris, and a .COM MIDI/CV controller. Others on the forum have described similar problems, but I've not seen a solution which works other than sending it in which is no longer an option. Does anyone want a $350.00 paper weight? Collision Forensics & Enginering, Inc.
A few thoughts, (sorry if I'm stating the obvious!). Have you scoped the 5V supply actually on the R60 PCB? I've had 5V supply transients/ringing mess up the settling of some D->A converters. I notice from both the web page and the manual that Eric stresses 'clean supplies', time and time again To me this suggests that the unit might have some stability issues. These may be unavoidable in a general purpose self tuning unit. 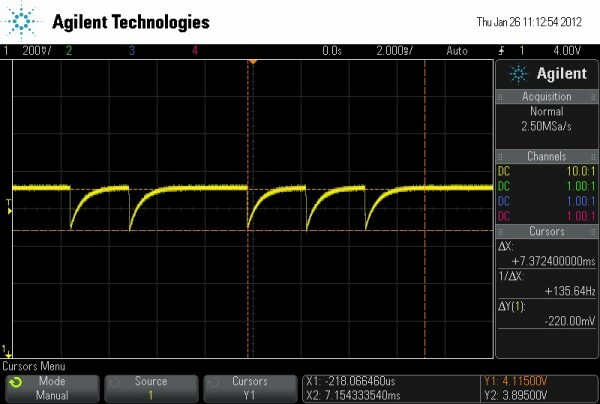 The waveform shown makes me think that the D->A is glitching, or that it's output filter, if any, is mis-behaving. A thought is to slowly step the output, using both keyboard and pitch bend, to see if there is any binary patterning in the output, that might indicate a component problem. The spikes could be the output 'hunting' on claibrate, or a form of jitter in the digital part of the unit, (hence my thoughts on the 5V supply). Next thought is that it is some kind of feedback loop problem. Since you have tried many VCO's, I think we can write off problems with the VCO's frequency slew rate. What happens if you put a glide/portamento device between the module output and the oscillator? And yes, I've heard that Eric is not the most subtle of people to deal with. . . .
All excellent ideas. I'll make some time tonight or tomorrow to try. Thanks again for the help. I've decided my time is better spent with other projects which are more fun than blindly trying to debug someone else's design. I might come back to this in a few months, and if I find anything helpful, I'll post it here.